Florance Jones - Florance jones bamboo 1800 deep pocket striped bed sheet sets hypoallergenic soft all sizes | collection sheet set shsthr-122018271 | queen twin 3pc sheet set: 1-flat sheet 66"w x 96"l, 1-fitted sheet 39"w x 75"l and 1-standard pillowcase 20"w x 30"l twin extra long xl 3pc Sheet Set: 1-Flat Sheet 70"W x 102"L, 1-Fitted Sheet 39"W x 80"L 1-Standard Pillowcase 20"W x 30"L.
Florance Jones Bamboo 1800 DEEP Pocket Striped Bed Sheet Sets Hypoallergenic Soft Collection Sheet Set SHSTHR-122018271 | Queen - Full 4pc sheet set: 1-flat sheet 80"w x 94"l, 1-fitted sheet 54"w x 75"L, and 2-Standard Pillow Cases 20"W x 30"L each. Florance Jones - Full 4pc sheet set: 1-flat sheet 80"w x 94"l, 1-fitted sheet 54"w x 75"L, and 2-Standard Pillow Cases 20"W x 30"L each. King 4pc sheet set: 1-flat sheet 110"w x 102"l, 1-fitted sheet 78"w x 80"L and 2-King Pillow Cases 20"W x 40"L each. California king 4pc sheet set: 1-flat sheet 110"w x 102"l, 1-fitted Sheet 72"W x 84"L and 2-King Pillowcases 20"W x 40"L each. Florance jones 6 piece paisley printed deep pocket bed sheet set - 5 beautiful colors available | collection sheet set shsthr-122022248 | queen twin 3pc sheet set: 1-flat sheet 66"w x 96"l, 1-fitted sheet 39"w x 75"l and 1-standard pillowcase 20"w x 30"l twin extra long xl 3pc Sheet Set: 1-Flat Sheet 70"W x 102"L, 1-Fitted Sheet 39"W x 80"L 1-Standard Pillowcase 20"W x 30"L.
Florance Jones 6 Piece Paisley Printed Deep Pocket Bed Sheet Set - 5 Beautiful Colors Available | Collection Sheet Set SHSTHR-122022248 | Queen - Queen 4pc sheet set: 1-flat sheet 92"w x 102"l, 1-fitted sheet 60"W x 80"L and 2-Standard Pillowcases 20"W x 30"L each. Sandover - Sandover egyptian comfort 2100 count 4 piece deep pocket bed sheet set wrinkle free usa| size king | style duv-5301218201 twin 3pc sheet set: 1-flat sheet 66"w x 96"l, 1-fitted sheet 39"w x 75"l and 1-standard pillowcase 20"w x 30"l twin extra long xl 3pc Sheet Set: 1-Flat Sheet 70"W x 102"L, 1-Fitted Sheet 39"W x 80"L 1-Standard Pillowcase 20"W x 30"L.
Queen 4pc sheet set: 1-flat sheet 92"w x 102"l, 1-fitted sheet 60"W x 80"L and 2-Standard Pillowcases 20"W x 30"L each. Sandover egyptian comfort 2100 count 4 piece deep pocket bed Sheet Set Wrinkle Free USA| Size King | Style DUV-5301218201. King 4pc sheet set: 1-flat sheet 110"w x 102"l, 1-fitted sheet 78"w x 80"L and 2-King Pillow Cases 20"W x 40"L each. Sandover Egyptian Comfort 2100 Count 4 Piece Deep Pocket Bed Sheet Set Wrinkle Free USA| Size King | Style DUV-5301218201 - Full 4pc sheet set: 1-flat sheet 80"w x 94"l, 1-fitted sheet 54"w x 75"L, and 2-Standard Pillow Cases 20"W x 30"L each. California king 4pc sheet set: 1-flat sheet 110"w x 102"l, 1-fitted Sheet 72"W x 84"L and 2-King Pillowcases 20"W x 40"L each. Florance Jones - Florance jones hotel quality egyptian4 pc ultra soft bed sheet set with free 2 pillow cases | collection sheet set shsthr-122020809 | queen twin 3pc sheet set: 1-flat sheet 66"w x 96"l, 1-fitted sheet 39"w x 75"l and 1-standard pillowcase 20"w x 30"l twin extra long xl 3pc Sheet Set: 1-Flat Sheet 70"W x 102"L, 1-Fitted Sheet 39"W x 80"L 1-Standard Pillowcase 20"W x 30"L.
Florance Jones Hotel Quality Egyptian4 Pc Ultra Soft Bed Sheet Set with Free 2 Pillow Cases | Collection Sheet Set SHSTHR-122020809 | Queen - King 4pc sheet set: 1-flat sheet 110"w x 102"l, 1-fitted sheet 78"w x 80"L and 2-King Pillow Cases 20"W x 40"L each. California king 4pc sheet set: 1-flat sheet 110"w x 102"l, 1-fitted Sheet 72"W x 84"L and 2-King Pillowcases 20"W x 40"L each. Queen 4pc sheet set: 1-flat sheet 92"w x 102"l, 1-fitted sheet 60"W x 80"L and 2-Standard Pillowcases 20"W x 30"L each. Florance Jones - California king 4pc sheet set: 1-flat sheet 110"w x 102"l, 1-fitted Sheet 72"W x 84"L and 2-King Pillowcases 20"W x 40"L each. Queen 4pc sheet set: 1-flat sheet 92"w x 102"l, 1-fitted sheet 60"W x 80"L and 2-Standard Pillowcases 20"W x 30"L each. King 4pc sheet set: 1-flat sheet 110"w x 102"l, 1-fitted sheet 78"w x 80"L and 2-King Pillow Cases 20"W x 40"L each. 12 Colors | Collection Sheet Set SHSTHR-122022112 | Queen - Florance Jones 6 Piece Egyptian Comfort 1800 Thread Count Deep Pocket Bed Sheet Set - Florance jones 6 piece egyptian comfort 1800 thread count deep pocket bed sheet set - 12 colors | collection sheet set shsthr-122022112 | queen twin 3pc sheet set: 1-flat sheet 66"w x 96"l, 1-fitted sheet 39"w x 75"l and 1-standard pillowcase 20"w x 30"l twin extra long xl 3pc Sheet Set: 1-Flat Sheet 70"W x 102"L, 1-Fitted Sheet 39"W x 80"L 1-Standard Pillowcase 20"W x 30"L.
King 4pc sheet set: 1-flat sheet 110"w x 102"l, 1-fitted sheet 78"w x 80"L and 2-King Pillow Cases 20"W x 40"L each. Sandover egyptian comfort 2100 count 4 piece deep pocket bed Sheet Set Wrinkle Free USA| Size King | Style DUV-5301218201. Twin 3pc sheet set: 1-flat sheet 66"w x 96"l, 1-fitted sheet 39"w x 75"l and 1-standard pillowcase 20"w x 30"l twin extra long xl 3pc Sheet Set: 1-Flat Sheet 70"W x 102"L, 1-Fitted Sheet 39"W x 80"L 1-Standard Pillowcase 20"W x 30"L.
King 4pc sheet set: 1-flat sheet 110"w x 102"l, 1-fitted sheet 78"w x 80"L and 2-King Pillow Cases 20"W x 40"L each. Queen 4pc sheet set: 1-flat sheet 92"w x 102"l, 1-fitted sheet 60"W x 80"L and 2-Standard Pillowcases 20"W x 30"L each. California king 4pc sheet set: 1-flat sheet 110"w x 102"l, 1-fitted Sheet 72"W x 84"L and 2-King Pillowcases 20"W x 40"L each. Florance Jones 4 Pieces Bed Sheet Set 1800 Series Deep Pocket Egyptian Comfort Multiple Colors | Collection Sheet Set SHSTHR-122020998 | Queen - Queen 4pc sheet set: 1-flat sheet 92"w x 102"l, 1-fitted sheet 60"W x 80"L and 2-Standard Pillowcases 20"W x 30"L each. California king 4pc sheet set: 1-flat sheet 110"w x 102"l, 1-fitted Sheet 72"W x 84"L and 2-King Pillowcases 20"W x 40"L each. Queen 4pc sheet set: 1-flat sheet 92"w x 102"l, 1-fitted sheet 60"W x 80"L and 2-Standard Pillowcases 20"W x 30"L each. Sandover - Twin 3pc sheet set: 1-flat sheet 66"w x 96"l, 1-fitted sheet 39"w x 75"l and 1-standard pillowcase 20"w x 30"l twin extra long xl 3pc Sheet Set: 1-Flat Sheet 70"W x 102"L, 1-Fitted Sheet 39"W x 80"L 1-Standard Pillowcase 20"W x 30"L. Sandover 1800 count egyptian comfort extra soft bed sheet Set Deep Pocket Sheets All Size| Size King | Style DUV-5301218201. Queen 4pc sheet set: 1-flat sheet 92"w x 102"l, 1-fitted sheet 60"W x 80"L and 2-Standard Pillowcases 20"W x 30"L each. Queen 4pc sheet set: 1-flat sheet 92"w x 102"l, 1-fitted sheet 60"W x 80"L and 2-Standard Pillowcases 20"W x 30"L each. California king 4pc sheet set: 1-flat sheet 110"w x 102"l, 1-fitted Sheet 72"W x 84"L and 2-King Pillowcases 20"W x 40"L each. Sandover 1800 Count Egyptian Comfort Extra Soft Bed Sheet Set Deep Pocket Sheets Size King | Style DUV-5301218201 - California king 4pc sheet set: 1-flat sheet 110"w x 102"l, 1-fitted Sheet 72"W x 84"L and 2-King Pillowcases 20"W x 40"L each. Sandover 1800 count egyptian comfort extra soft bed sheet set deep pocket sheets all size| size king | style duv-5301218201 twin 3pc sheet set: 1-flat sheet 66"w x 96"l, 1-fitted sheet 39"w x 75"l and 1-standard pillowcase 20"w x 30"l twin extra long xl 3pc Sheet Set: 1-Flat Sheet 70"W x 102"L, 1-Fitted Sheet 39"W x 80"L 1-Standard Pillowcase 20"W x 30"L.
Sandover egyptian comfort 2100 count 4 piece deep pocket bed Sheet Set Wrinkle Free USA| Size King | Style DUV-5301218201. King 4pc sheet set: 1-flat sheet 110"w x 102"l, 1-fitted sheet 78"w x 80"L and 2-King Pillow Cases 20"W x 40"L each. Full 4pc sheet set: 1-flat sheet 80"w x 94"l, 1-fitted sheet 54"w x 75"L, and 2-Standard Pillow Cases 20"W x 30"L each. Florance Jones - Sandover egyptian comfort 2100 count 4 piece deep pocket bed Sheet Set Wrinkle Free USA| Size King | Style DUV-5301218201. Queen 4pc sheet set: 1-flat sheet 92"w x 102"l, 1-fitted sheet 60"W x 80"L and 2-Standard Pillowcases 20"W x 30"L each. King 4pc sheet set: 1-flat sheet 110"w x 102"l, 1-fitted sheet 78"w x 80"L and 2-King Pillow Cases 20"W x 40"L each. Florance Jones 4 Pieces Checkered Deep Pocket 1800 Egyptian Series Multi Colors Bed Sheet Sets | Collection Sheet Set SHSTHR-122021957 | Queen - King 4pc sheet set: 1-flat sheet 110"w x 102"l, 1-fitted sheet 78"w x 80"L and 2-King Pillow Cases 20"W x 40"L each. Full 4pc sheet set: 1-flat sheet 80"w x 94"l, 1-fitted sheet 54"w x 75"L, and 2-Standard Pillow Cases 20"W x 30"L each. Queen 4pc sheet set: 1-flat sheet 92"w x 102"l, 1-fitted sheet 60"W x 80"L and 2-Standard Pillowcases 20"W x 30"L each. Queen 4pc sheet set: 1-flat sheet 92"w x 102"l, 1-fitted sheet 60"W x 80"L and 2-Standard Pillowcases 20"W x 30"L each. California king 4pc sheet set: 1-flat sheet 110"w x 102"l, 1-fitted Sheet 72"W x 84"L and 2-King Pillowcases 20"W x 40"L each. California king 4pc sheet set: 1-flat sheet 110"w x 102"l, 1-fitted Sheet 72"W x 84"L and 2-King Pillowcases 20"W x 40"L each. Florance Jones - Queen 4pc sheet set: 1-flat sheet 92"w x 102"l, 1-fitted sheet 60"W x 80"L and 2-Standard Pillowcases 20"W x 30"L each. California king 4pc sheet set: 1-flat sheet 110"w x 102"l, 1-fitted Sheet 72"W x 84"L and 2-King Pillowcases 20"W x 40"L each. Queen 4pc sheet set: 1-flat sheet 92"w x 102"l, 1-fitted sheet 60"W x 80"L and 2-Standard Pillowcases 20"W x 30"L each. Florance Jones HIGH Thread Count 1800 4 Piece Bed Sheet Set - Egyptian Cotton Feel | Collection Sheet Set SHSTHR-122020319 | Queen - Full 4pc sheet set: 1-flat sheet 80"w x 94"l, 1-fitted sheet 54"w x 75"L, and 2-Standard Pillow Cases 20"W x 30"L each. California king 4pc sheet set: 1-flat sheet 110"w x 102"l, 1-fitted Sheet 72"W x 84"L and 2-King Pillowcases 20"W x 40"L each. Full 4pc sheet set: 1-flat sheet 80"w x 94"l, 1-fitted sheet 54"w x 75"L, and 2-Standard Pillow Cases 20"W x 30"L each. Florance jones high thread count 1800 4 piece bed sheet set - egyptian cotton feel | collection sheet set shsthr-122020319 | queen twin 3pc sheet set: 1-flat sheet 66"w x 96"l, 1-fitted sheet 39"w x 75"l and 1-standard pillowcase 20"w x 30"l twin extra long xl 3pc Sheet Set: 1-Flat Sheet 70"W x 102"L, 1-Fitted Sheet 39"W x 80"L 1-Standard Pillowcase 20"W x 30"L.
Dyla LLC - The result is a delicious cold brew that delivers a remarkably quick and clean caffeine buzz. 2 oztravel readycertified organic twin 3pc sheet set: 1-flat sheet 66"w x 96"l, 1-fitted sheet 39"w x 75"l and 1-standard pillowcase 20"w x 30"l twin extra long xl 3pc Sheet Set: 1-Flat Sheet 70"W x 102"L, 1-Fitted Sheet 39"W x 80"L 1-Standard Pillowcase 20"W x 30"L.
FORTO Coffee Shots - Fast Coffee Energy Boost, Sample - 200mg Caffeine, Chocolate Latte, Ready-to-Drink on the go, High Energy Cold Brew Coffee - Twin 3pc sheet set: 1-flat sheet 66"w x 96"l, 1-fitted sheet 39"w x 75"l and 1-standard pillowcase 20"w x 30"l twin extra long xl 3pc Sheet Set: 1-Flat Sheet 70"W x 102"L, 1-Fitted Sheet 39"W x 80"L 1-Standard Pillowcase 20"W x 30"L. Will you enjoy forto, and get energy from it? - our family guarantees it, or we'll happily refund your purchase. Each 2 ounce serving packs 200mg of natural caffeine, delivering pure coffee energy - anytime, anywhere. California king 4pc sheet set: 1-flat sheet 110"w x 102"l, 1-fitted Sheet 72"W x 84"L and 2-King Pillowcases 20"W x 40"L each. California king 4pc sheet set: 1-flat sheet 110"w x 102"l, 1-fitted Sheet 72"W x 84"L and 2-King Pillowcases 20"W x 40"L each. Queen 4pc sheet set: 1-flat sheet 92"w x 102"l, 1-fitted sheet 60"W x 80"L and 2-Standard Pillowcases 20"W x 30"L each. Made using only simple, natural ingredients like farm fresh organic whole milk and Arabica coffee sourced from family-owned farms in Colombia. Full 4pc sheet set: 1-flat sheet 80"w x 94"l, 1-fitted sheet 54"w x 75"L, and 2-Standard Pillow Cases 20"W x 30"L each. 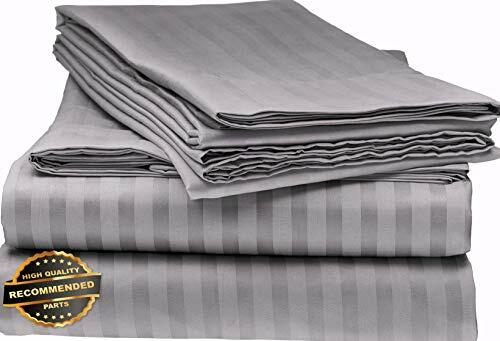 Florance Jones Egyptian 1800 Premium Quality Ultra Soft Striped Bed Sheet Set | Collection Sheet Set SHSTHR-122021473 | Queen - Full 4pc sheet set: 1-flat sheet 80"w x 94"l, 1-fitted sheet 54"w x 75"L, and 2-Standard Pillow Cases 20"W x 30"L each. Sandover egyptian comfort 2100 count 4 piece deep pocket bed Sheet Set Wrinkle Free USA| Size King | Style DUV-5301218201. Twin 3pc sheet set: 1-flat sheet 66"w x 96"l, 1-fitted sheet 39"w x 75"l and 1-standard pillowcase 20"w x 30"l twin extra long xl 3pc Sheet Set: 1-Flat Sheet 70"W x 102"L, 1-Fitted Sheet 39"W x 80"L 1-Standard Pillowcase 20"W x 30"L.